Foreign languages play an essential part in the Waldorf curriculum. Language is the gateway to understanding the genius, perspective and expression of each culture. Empathic abilities are fostered by exposure to and experience of other ways of viewing the world, and allow a new perspective on one’s own culture. Rudolf Steiner ideally intended children to be exposed to two contrasting foreign languages. Spanish and Japanese are both taught at Westside Waldorf School, beginning in First Grade. From First to Third Grade, language lessons focus on oral immersion, developing the children’s sensitivity to basic patterns of intonation. The language is explored through common daily activities and seasonal experiences, which are often mimed, acted, and sung. By Fourth Grade, the children begin to write and read the language, using poems, stories, and dialogue acquired in the repertoire of the first three grades. It is the task of students during these middle years to develop their ability to read and write a foreign language, doing simple dictations and writing answers to questions that have first been dealt with orally. In the Seventh and Eighth Grades, much of what has been practiced by way of poetry, songs, and pronunciation exercises is continued and, in addition, printed books are introduced. 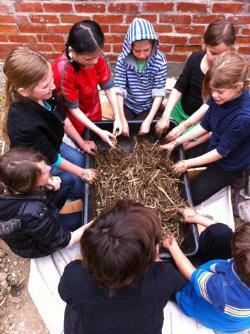 A fundamental principle of Waldorf Education is that children learn by doing (and making), and that out of activity and movement thinking arises. More and more this view is being corroborated by current neurological research on brain development, and an appreciation for kinesthetic learning is growing. Flexible, agile fingers in childhood support mobile, creative thinking in adult life and the enhancement of the faculty of judgment. In addition, hand-eye coordination is essential for balance and harmony in both body and mind. Learning care and respect for materials encourages feelings of moral and social responsibility. Working with one’s hands also develops an appreciation for the work of others. 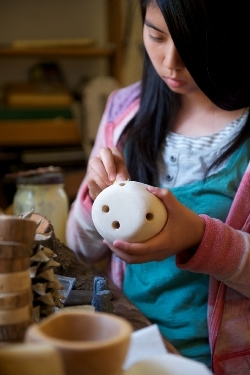 These activities build creative confidence and self-directed activity. Experiencing a variety of materials visually, tactilely, even through the auditory and olfactory senses, cultivates more subtleness and differentiation of feelings. Quality and utility are conscientiously brought to bear in the handwork classes. 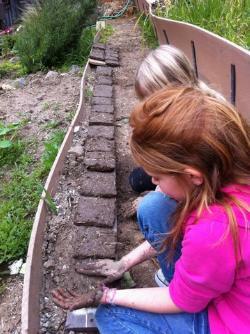 All projects are utilitarian as well as therapeutic and compliment the curriculum. Handwork offers many opportunities for reinforcing such things as math skills in practical, challenging, and enjoyable ways. 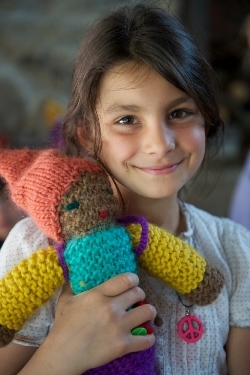 Handwork projects through the grades include knitting, crocheting, felting, spinning, sewing, cross-stitching, doll-making, stuffed animals, embroidery and more. 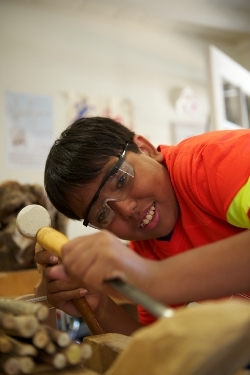 In Fourth Grade, students begin formal woodworking classes, though they have had many earlier, informal experiences. Learning how to use simple tools safely and effectively, they make practical objects and toys, and continue through the upper grades, developing skillfulness of both accuracy and design. The teacher attempts to awaken a feeling for how to work with the material, and for combining usefulness and beauty in the making of objects. Eurythmy ("beautiful or harmonious movement") is an art of movement, and a performing art, which is a unique part of the Waldorf curriculum. The art of Eurythmy was established earlier this century, growing out of the work of Rudolf Steiner, and was part of Waldorf schools from their inception. Neither dance nor mime, Eurythmy uses the body as an instrument in space. Rather than working on the relationship of the human body to physical laws, such as in gymnastics, Eurythmy works with the experience of physical laws, speech, and music on the human soul, interpreting these experiences through movement. The air is the medium in which a Eurythmist make forms and gestures much as a sculptor uses wood or stone, striving to make visible the invisible dance of creative sound. Through the study of Eurythmy students develop concentration, spatial orientation and dexterity, and are engaged in the rhythms of speech and music as experienced and interpreted through the whole body. Musical education combines experiencing the movement of rhythms, the feeling of harmony and musical moods, and musical knowledge grasped through musical theory. Waldorf students are immersed in the musical element through singing, hearing and playing instruments, and as they grow they progress towards an understanding for the language and principles of music. 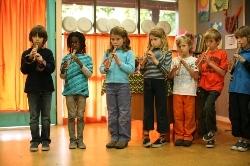 Beginning in the first grade, the children at the Westside Waldorf School are taught to play the recorder, and singing is a regular part of the school week in many classes. In the early grades, the âmood of the fifthâ predominates in the songs and music students learn to play on their pentatonic flutes. Third graders begin string instruction with a choice of violin, viola, or cello. Students in Grade Six through Eight participate in recorder ensemble, middle school choir, and strings classes. In addition, there are special programs with folk dancing, folk singing and student participation around every corner. 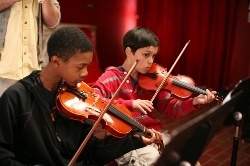 Year-round there are numerous opportunities for students to perform instrumental, orchestral, and choral compositions in public performances, school assemblies, musical plays and special community events. There are many important inner skills to be learned through the study of music. Practicing an instrument cultivates inner discipline. Group music lessons offer a wonderful opportunity for a child to practice active listening skills and to work cooperatively with others. It is quite challenging for a group of children to work completely in unison in any realm, be it social, academic or physical! In trying to play their instruments as a group, with the same timing and pitch, the result of a harmonious sound allows them to directly experience the value of working well together. Playing an instrument is a wonderful means of self-exploration, self-expression and creativity that allows the student to grow into a well-rounded human being. Movement Education and Games in the Waldorf curriculum springs from the same understanding of a child's development that underlies the academic curriculum in a Waldorf school. This deeper understanding is taken into account when choosing the activities, the shapes that are used in the group games, and the emphasis of the class (for instance whether games are played with an emphasis on fun, or with an emphasis on âplaying by the rulesâ). Each class contains a rhythm of joining together and moving apart, highly active games balanced with quieter games, working together as a group and taking a few moments to reflect on one's own body and movement. Games in First and Second Grade are relatively unstructured and have the gesture of the circle, keeping the children protected and as part of the whole. Progressing through the grades, the children are slowly entering into their individuality, and the games curriculum reflects this by, for instance, adding line games in the third grade to the now familiar circle games. In fifth grade there is a focus on beauty and form, and in the spring Fifth Graders participate in the Greek Games, a gathering of Fifth Grade classes from several regional Waldorf schools. In grades 6, 7 and 8 more conventional sports are brought into the curriculum, because only now can the children have a real respect for the law of rules, and understanding how a team works together while at the same time developing their own self-discipline and competitive nature. They are aspiring upwards in terms of exactness, technique, timing and the spirit of the law, while also becoming more aware of the world around them. In a culture where organized team sports hold such high status, children can sometimes think of movement only in these terms. 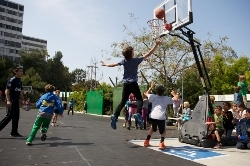 The Movement Education curriculum tries to give the children basic coordination and movement skills that will help them when they decide to play organized sports. 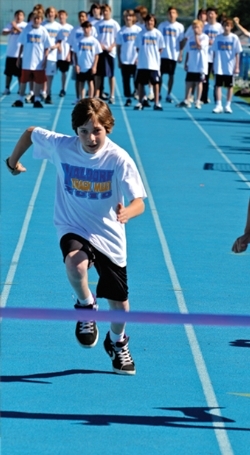 Depending on the grade, the children will play games or do relay races that serve to develop a skill that is also required for a conventional sport such as basketball. String games, jump rope and a balloon relay are all activities that develop skills that can be used in many different sports. Not only do movement classes provide the opportunity for the children to play games and have fun, these classes also work with their social interactions by teaching them to play with one another before they play against one another, to acknowledge one another, to play safely, and to gain an appreciation for all kinds of movement.